is a spectacular object just seen with the naked eye below the big W of Cassiopeia. It is our closest neighboring galaxy in what is known as the Local Group. That is still a staggering 3,000,000 light-years away. Bear in mind that one light-year is 6,000,000,000,000 miles. It was this object that Edwin Hubble first identified as another galaxy to itself, rather than a nebula within our own Milky Way galaxy. 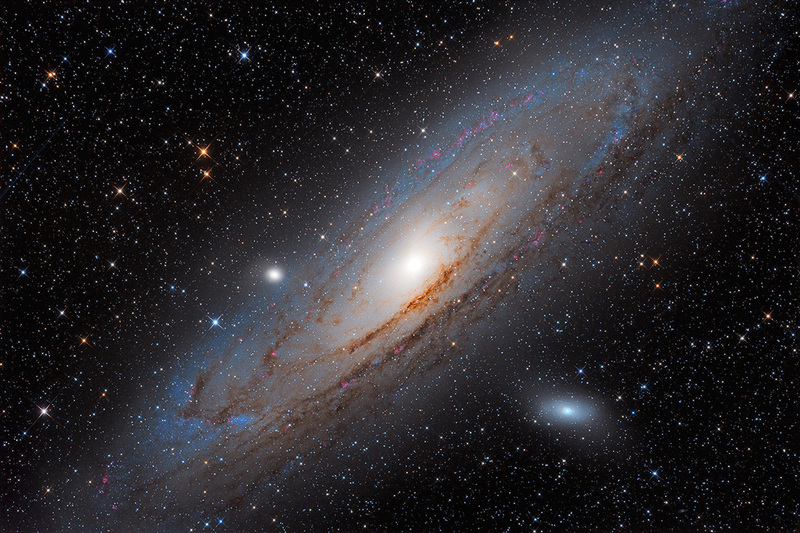 The large 'star' at about 9 o'clock on the galactic disk is sub-galaxy M32, and at 4 o'clock is another called M110. M31 is somewhat edge-on from our vantage point, but we see much of its spiral arms, and the dark lanes coursing through it are magnificent. Many thanks to my friend Pavel Pech for this fine data and the collaboration.